Hopefield Fab – industry leaders in producing metal bar tops, over bar glass racks, under-counter units and decorative metalwork – are celebrating a year of hosting three apprentices. With a management team with over 80 years’ experience; they are the ideal traders to learn from. Current Hopefield Fab apprentices are Corey Salisbury (16), Jake Sawden (19) and Dion Davies (18): all attending Alliance Learning Centre, Horwich. 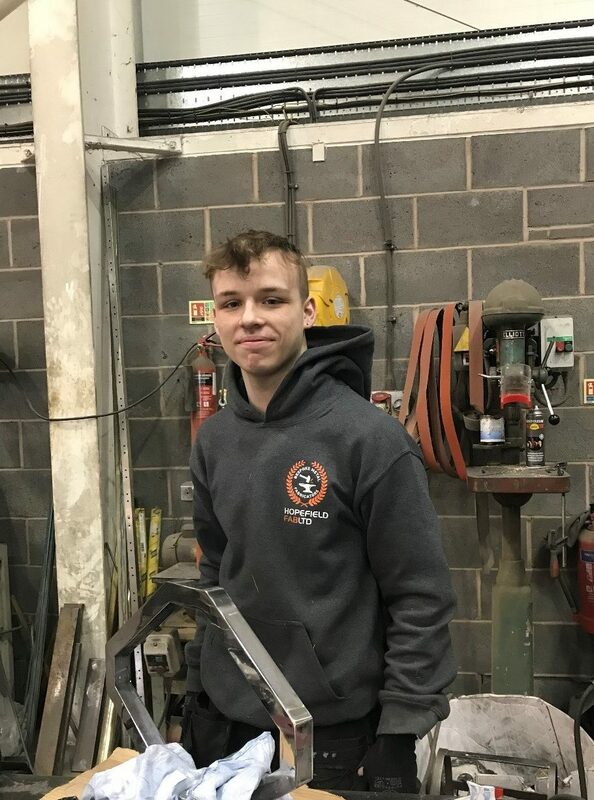 Though they are all coming up to the end of their first year at the company, they are in different stages of their learning, with Corey and Jake undertaking their first year and Dion his third year of the Fabrication and Welding apprenticeship. Whilst it’s an interesting career, it isn’t an easy one – very often the company receives only a designer’s visual and then has to figure out how this can be practically manufactured. Apprentices have to show initiative and will learn to have the ability to work out the cost of production, how to match designer’s expectations, and nurture their creativity.